Ben - We've heard about current astronomical research and the importance of communication, but it's also essential for us to understand how astronomy was understood and communicated in the past. I went along to the Whipple Museum of the History of Science here in Cambridge and met Josh Nall to find out how globes can tell us a story about our understanding of the solar system. Josh - We're in the upper gallery of the Whipple Museum. This has traditionally been a space that the museum has used for special exhibitions and temporary exhibitions. The most recent one of which we put in here was an exhibition of the museum's very extensive and impressive collection of globes. Ben - What is it that we can learn from looking at globes? Josh - They represent a side of astronomy that we perhaps often might not think about which is the popular, public side of astronomy. They're not your typical big telescope. They represent the material culture of the consumption of astronomy, so I think they're interesting in that sense. The other reason that they're particularly interesting is that - especially in this case of these globes - what they do is that they can serve as a kind of challenge to the conventional story that we have. So, if you take the case of Mars, there are lots of well-known stories about Mars, particularly about what I'm interested in which is this controversy over whether or not there were canals on Mars. And the globes were an interesting way to look at that story and see if you could fit the globes within that story and I found in a sense that you couldn't. Therefore, the globes were a nice kind of challenge to the conventional story about Mars. Ben - So moving over to your display of Mars globes, there are five different globes in here and if it wasn't for the label, I would not know that these were supposed to be showing me the same planet. Josh - Yeah. I mean, that's one of the most remarkable things about them. It immediately strikes you and I think it's such a wonderful collection to have in one case. You're completely right. They look - all five of them look really very different. Probably, the only possible similarity between all of them that you can see is this tendency towards a kind of orangey-brown hue. Other than that, the features that they mark on all them look very, very different. And this is over a very short time span as well if we look at these globes. If we look at the three globes that pre-date the space age that we have here, the first one's from 1873, the next one 1898, and the next 1913. So you're looking at a span of 40 years and really, they're completely different, each globe and that to me is absolutely fascinating. And one of the things that drew me to this and made me want to discover - why were they made, and what are they depicting, and who is making them? And of course, who was consuming? Who was looking at them? Ben - Who were these aimed at? Were these for scientists to mark out what they've seen and then check it later? Where they for the public to consume or where they for a rather more discerning, perhaps wealthy clientele, just as an object of art? Josh - Well I think each globe has a slightly different intended audience. If you look at our first one from 1873, now this pre-dates the idea of canals. The canals were first mentioned by an Italian astronomer in 1877. So, this globe that pre-dates them is a very interesting artefact of the period just before this when, for the first time, Mars was beginning to be coherently mapped. So, what we need to understand about Mars is that it was at the very limit of the resolving power of Victorian telescopes. It was an extremely difficult object to observe, even under the best conditions. And now, this globe is one of the first to set down and embody a coherent map of Mars and I think in a way, that's why this globe was made. The map itself is by a very famous Victorian - what you might want to call a populariser of astronomy, a gentleman called Richard Proctor. He had taken the numerous drawings of the Reverend William Rutter Dawes who was known amongst the Mars observing community to be a particularly good observer and draftsman, and he had collated all these drawings and produced the coherent map. Ben - So working on that basis, we can look through the rest and see how the details, the names, the structures, the contrast has actually changed and oddly, it seems to change quite dramatically. In fact, the most recent globe you have which is just from 1978 seems to have lost a lot of the detail. Josh - Yeah, absolutely. I mean, what happens is that after 1877, Schiaparelli talks about these canalae. There are certain people within the astronomical community who jumped upon this idea of possible canals as potentially evidence for extraterrestrial life on Mars. Now this may sound whacky to us, but it absolutely was not at that time. Camille Flammarion, who is the man who commissioned and produced the map for our second globe for 1898, he jumped on the canals as suggested by Schiaparelli and he setup his own observatory on the outskirts of Paris especially for observing Mars, and he produced this globe. And we can see that there's a great deal of more detail on this globe than the earlier and that detail is particularly lots of straight dark lines and those, Flammarion suggested, may be evidence that there's intelligent on Mars, constructing waterways. It's a slightly organically shaped surface, Flammarion slightly hedges his bets a little, and that is distinct from our next globe which very much takes this Flammarion model of having these straight lines and turns it into an absolutely and completely linear construction. It's made by a Danish artist who we know very little about, a bed-ridden Danish artist who hand painted them and she's based it on the maps of the very famous American Percival Lowell. He was an extremely wealthy businessman, an interested amateur scientist. And so, he built his own observatory in Flagstaff, Arizona. The observatory is still there and now, he absolutely believed that the canals were definite evidence. They are ruler straight on his maps and they're connected by nodes and the nodes he said were the main habitations for the Martians. And so, this globe was made by this artist, Ingeborg Bruhn. It was her way of kind of distributing what she thought was a true representation of Mars. Ben - Moving forward around 60 years, we have a globe from 1970. Now by this point of course, we have much better telescopes, we have been out into our solar system. What does this globe tell us? Josh - Well this globe probably just post-dates the first NASA missions to Mars. Obviously, our interest in Mars continues. Even the idea of the canals doesn't go away. The history of astronomy sometimes is written as if it disappears. Public interest in Mars is still very strong. 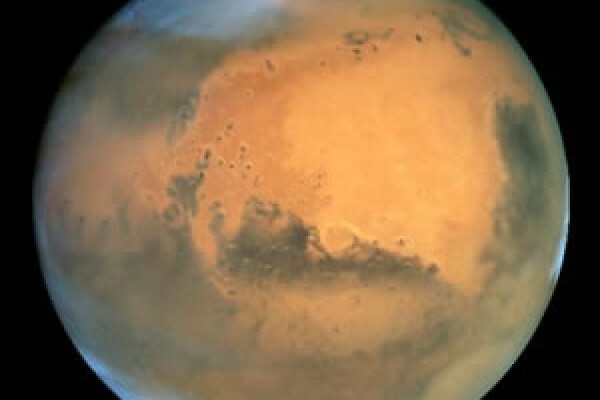 NASA is very keen to send probes to Mars itself to be able to take images close up. In the mid-60s, Mariners 3 and 4 are sent to do just this and Mariner 4 is able to fly past Mars and send back close-up images of the Martian surface. Now these images are quite limited, but what they do show is that there's no sign of Martians - no cities, no canals, and it appears to be quite an arid pock-marked surface with lots of craters in. And so this globe which is produced just after it is intended to show this feature and so, what's interesting I think is that they've retained very much this idea of Mars having lots of interesting and novel surface features. There's a lot of contrast in this globe and there's an awful lot of craters and features and big mountains, and volcanoes. I think it's kind of hanging on to this idea of Mars having all of these interesting novel features on its surface. That idea doesn't last that long. If we then look at the next globe which is made in 1978, so probably about 10 years after this globe, this is made after Mariner 9 which is the first space probe that was actually able to orbit Mars and that sends back images of 100% of the surface. And it's only then when it really hits home that Mars is quite different from a lot of these previous ideas, and in fact, it's actually quite a featureless, in many ways, planet. It seems to be very flat, very arid, very rocky, but it does have a small number of really rather spectacular and huge features - giant craters, the remnants of what appear to be river beds, there are volcanoes. And so, this globe is a topographical globe that actually shows the 3-dimensional features of the Martian surface. Ben - Josh Nall explaining how globes can help to fill in our understanding of the history of astronomy.